Solar power is rapidly progressing from merely a “feel-good” issue to an increasingly impressive alternative to fossil-fuel derived electricity, especially as the cost of fuel escalates and the state of the economy deteriorates. 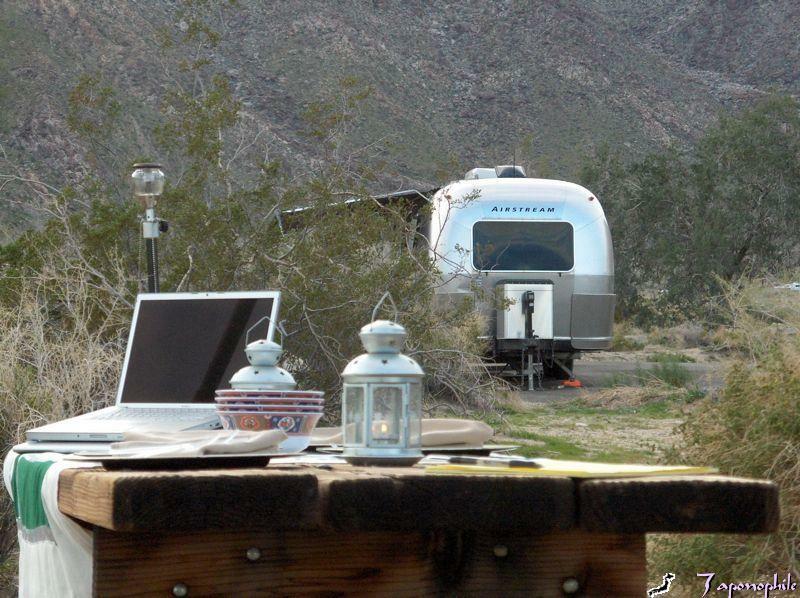 Our Airstream factory-installed solar charging system, utilizing two 53-watt solar panels, enables us to enjoy our favorite style of non-hook-up camping in the solitude of nature, away from noisy generators and crowds. 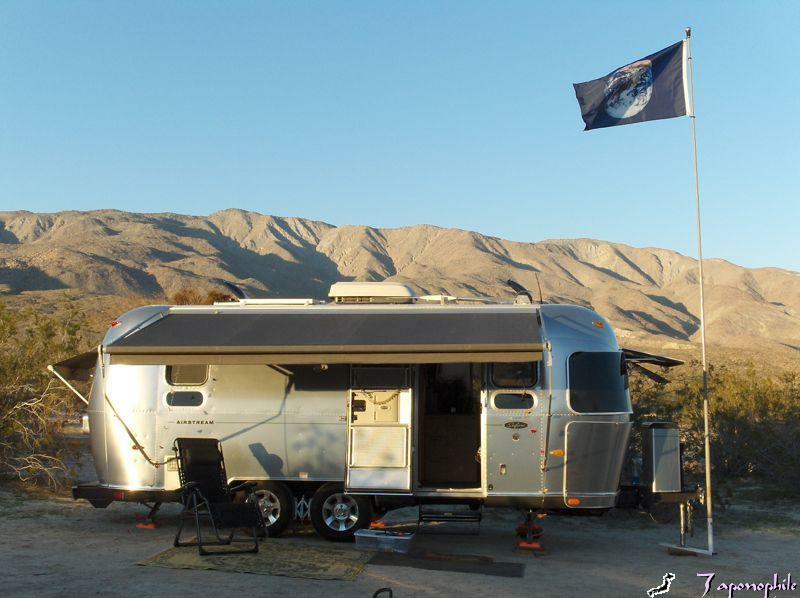 We recently returned to our favorite desert non-hook-up site at Vallecito Regional Park nearby Ghost Mountain and raised our Earth flag. 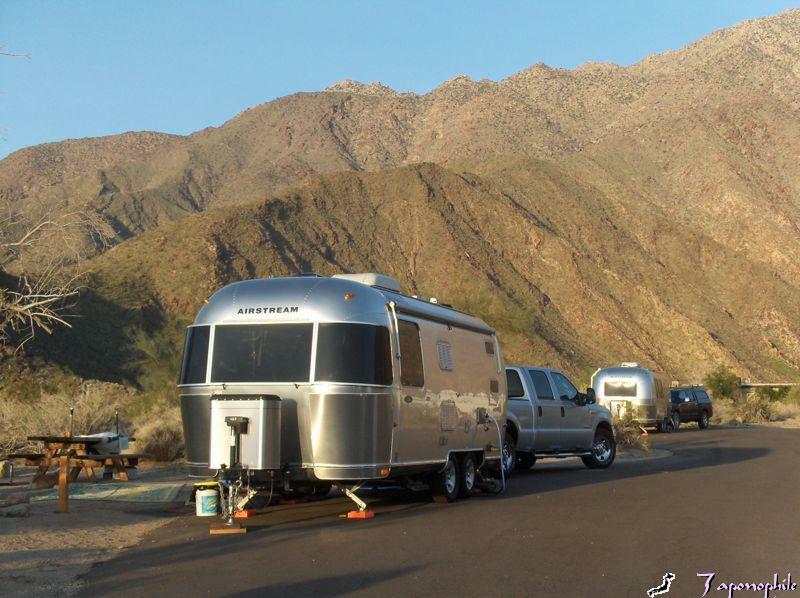 The Airstream factory installed two solar panels at our request as part of the solar option, custom order. 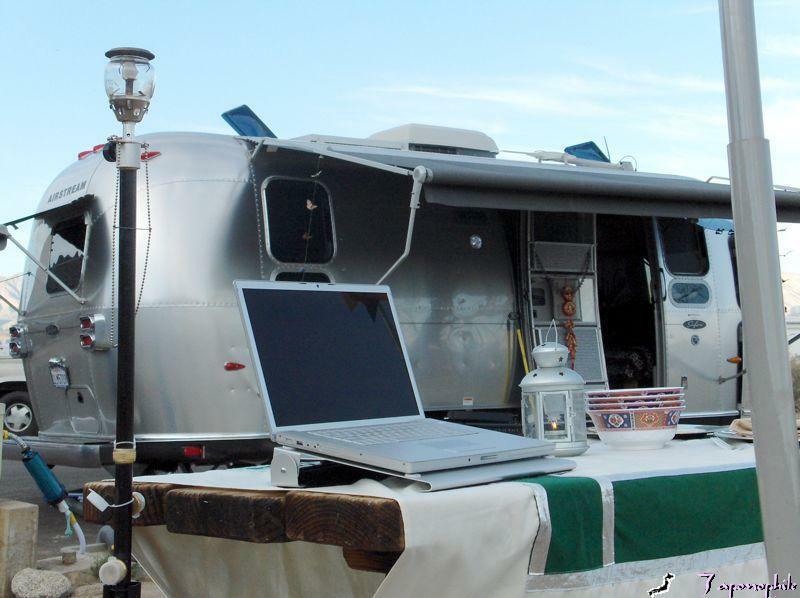 I interviewed an Airstream representative who told me that Airstream first installed solar panels in 1994, and that most Airstream trailers were pre-wired for the solar option starting in 2000. Solar panels can also be added as an after-market item as described by Rich Luhr in his Tour of America blog. 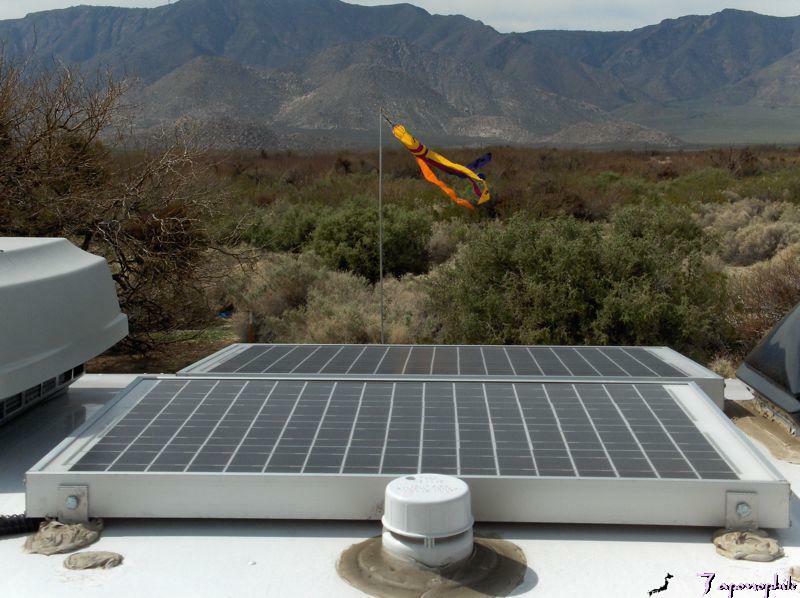 Our solar charging system consists of two 53-watt solar panels, two Lifeline AGM (Glass Mat) batteries, a charge controller, and panel display. Take the tour of our trailer and join the discussion at airforums.com. Rich Luhr’s system helped him to recharge his batteries after freezing nights and furnace use at Yellowstone. We are pleased with our system which has consistently recharged our batteries to 100% by mid to late morning every camping day. We also continue to make progress towards more efficient energy utilization as technology continues to improve. 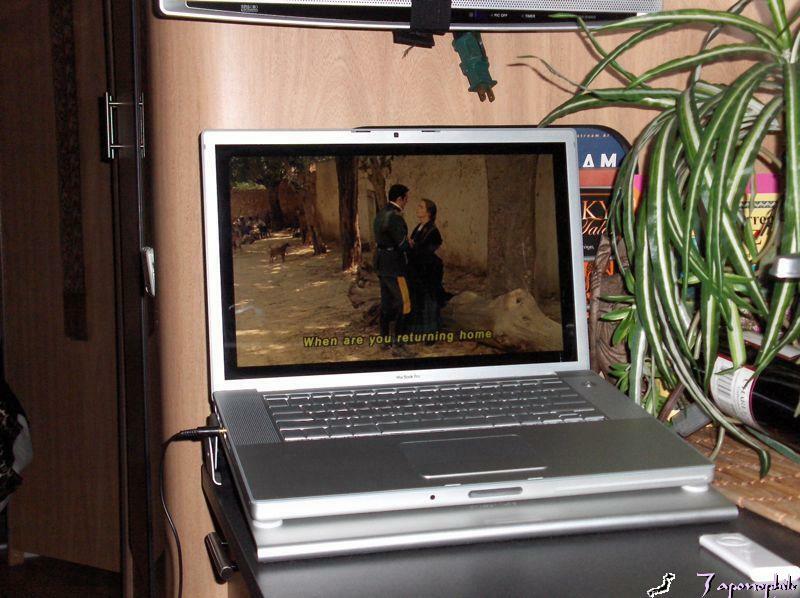 For example, with our new MacBook Pro we can now watch the same DVD of the opera Carmen, and yet use much less power by not turning on the trailer’s LCD and 600-watt inverter. The following morning, we recharge the laptop and other small electrical appliances (2-way radios, portable speakers, cameras) with the Kensington Ultra Portable Power Inverter 150. This product works well and uses energy more efficiently than our 600-watt trailer inverter. The following two products kick efficient energy use up a notch. With minimal power, the iPod touch presents your favorite videos, internet sites, music, etc., which can be listened through its lightweight earphones. 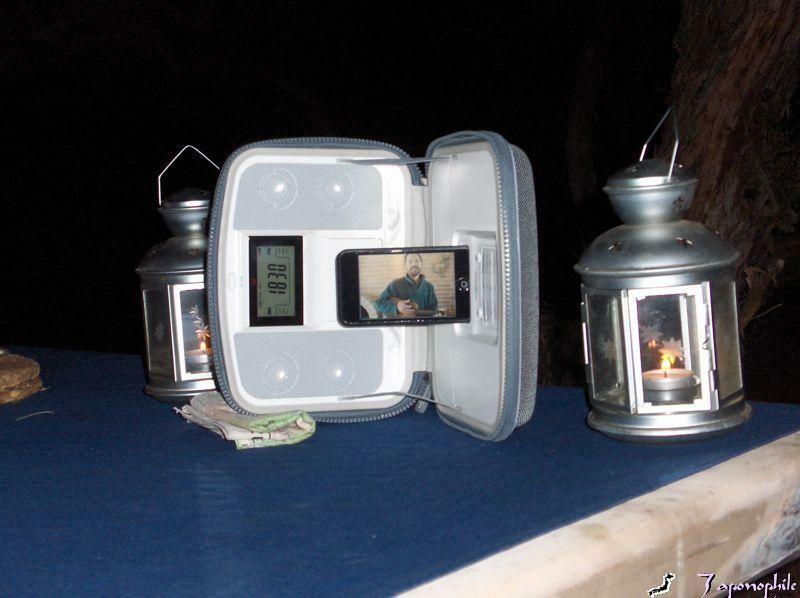 A group can also enjoy sitting around a picnic table in the evening and watching a movie when the iPod is attached to the i-F3 Portable iPod Speakers, rechargeable dock station, and built-in FM radio and alarm clock. Or you could make your own music and use even less power. 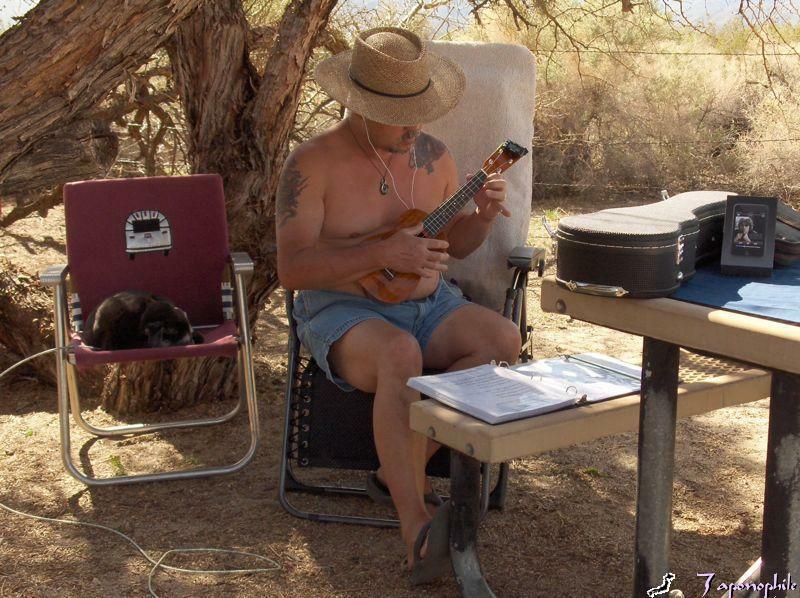 Here Larry is practicing his ukulele while listening to a recording of Iz on the iPod. I’m learning to play “The Universe Song”* by Eric Idle and seen in the Monty Python movie, “The Meaning of Life“,* that reminds us of our place in the universe and that the sun is the source of all our power. 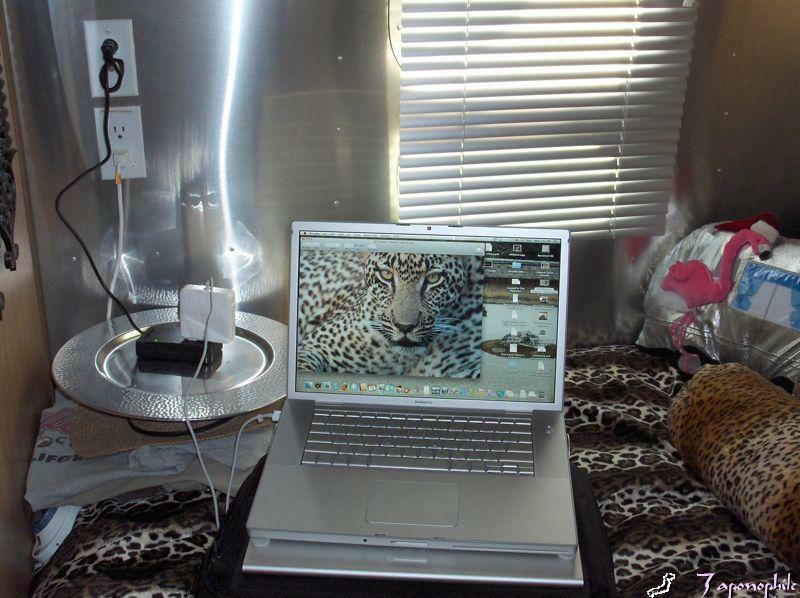 Additional information on choosing and designing a solar system for your Airstream can be found in Michael and Susan Snowden’s article, “Powering Your Airstream with Sunlight”, in the Fall 2005 issue of Airstream Life. 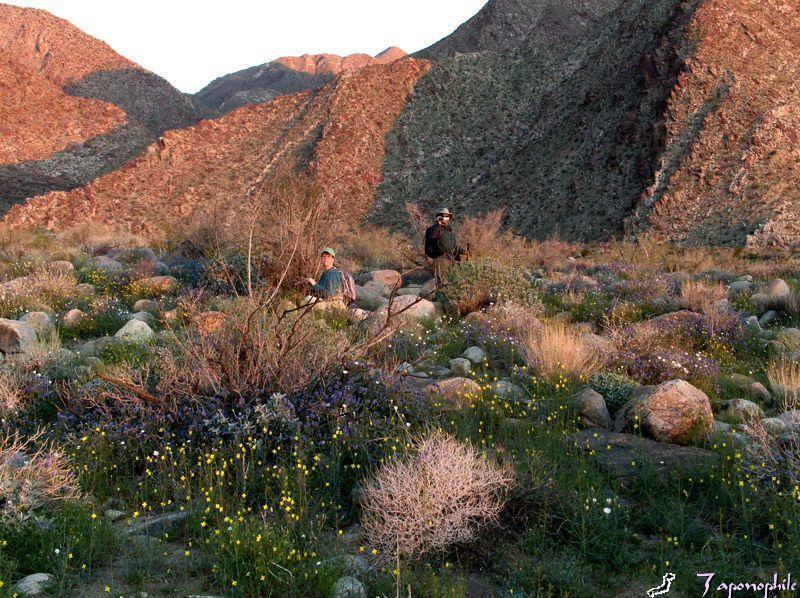 It might be snowing where you are, but it’s spring wild flowers in Anza-Borrego Desert, CA., as we take one more look at the spectacular view and cherish the memories of a very special and magical Safari trip. 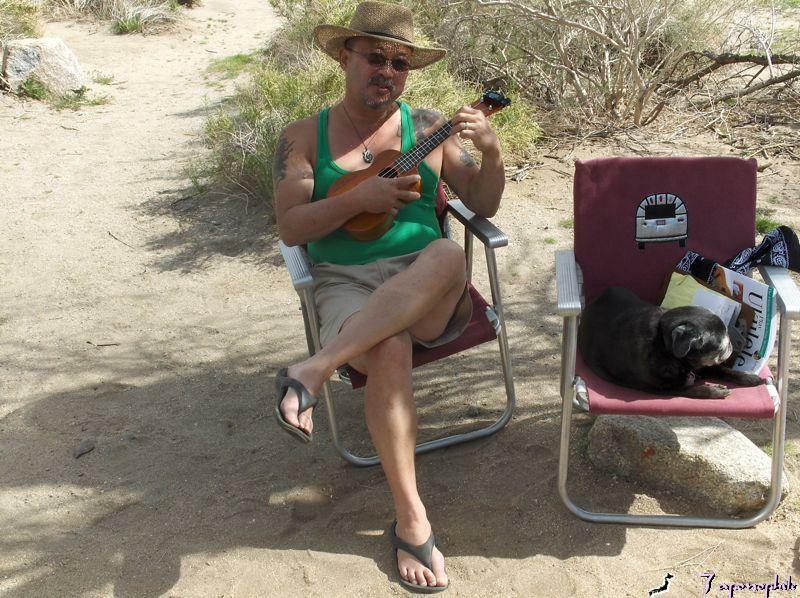 Last week we joined Rich C. and Sadira at Palm Canyon Campground. 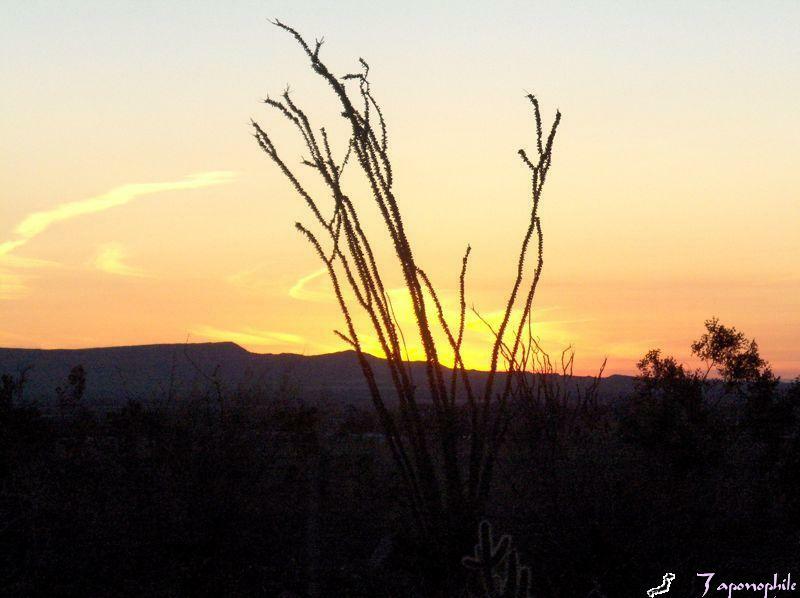 Warm, early morning sunlight bathed our trailers and wild flowers. 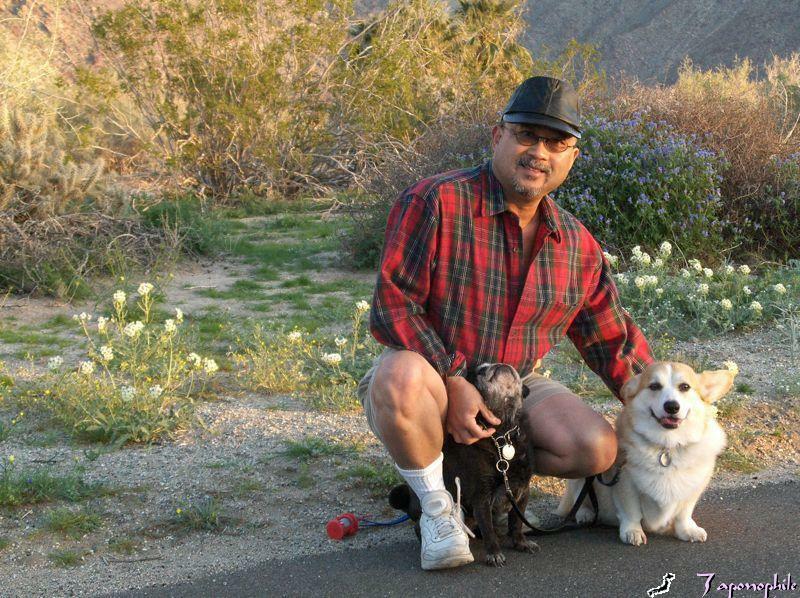 Our Pug, Pau Hoa, and Corgi, Mac, always enjoy early morning walks with Larry. 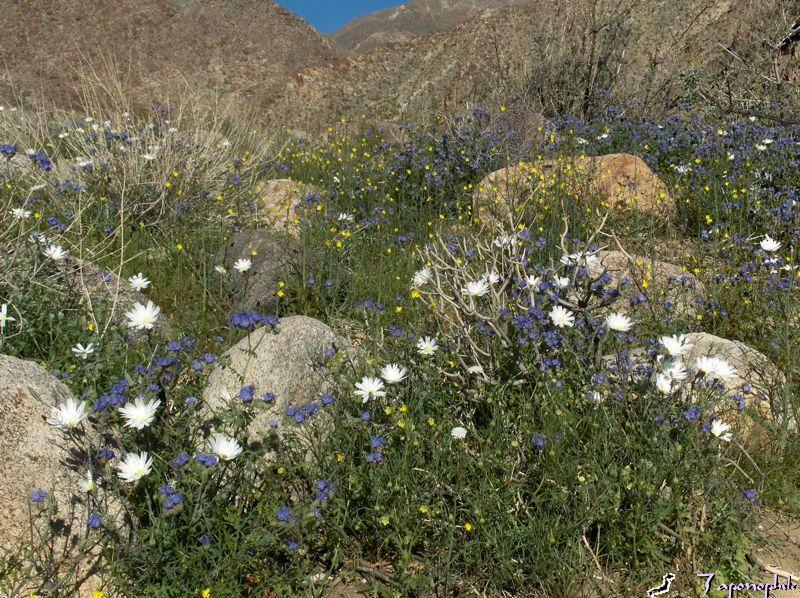 Fields of Wild Heliotrope and Desert Chicory dance in the mid-morning sun. 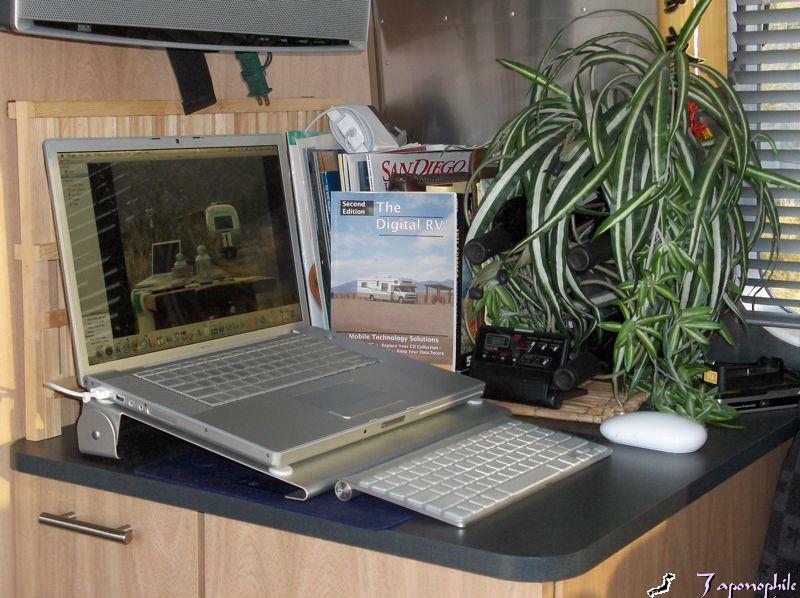 Our MacBook Pro also seemed to enjoy the early morning sun while sitting on our credenza next to a very helpful reference, The Digital RV, Second Edition, by R.L. Charpentier. 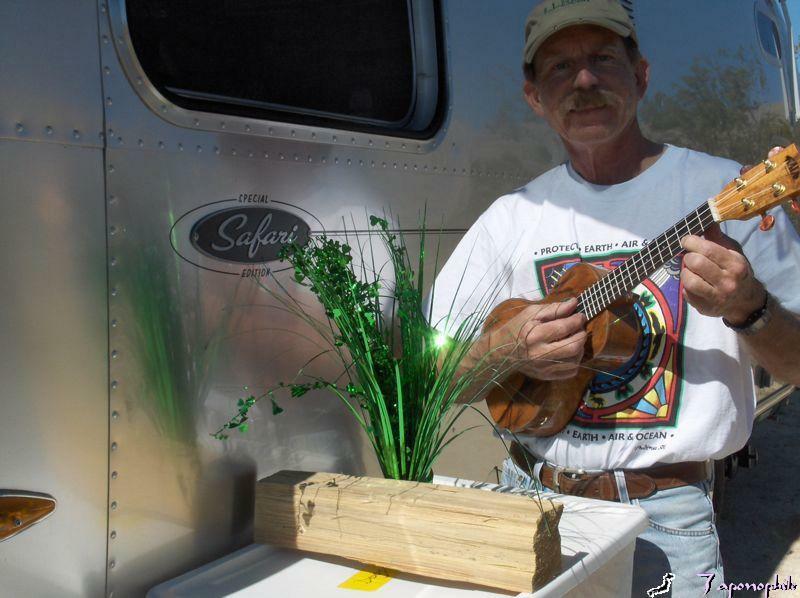 Larry has been composing Airstream songs while serenading Pau Hoa with his ukulele. 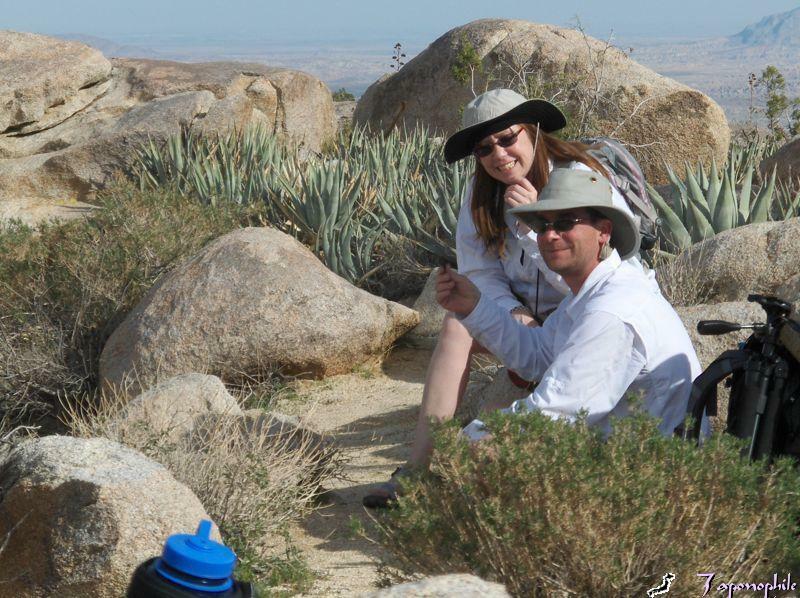 Meanwhile, I joined Rich C. and Sadira on a hike up Ghost Mountain, and this time I remembered to bring my water bottle. Rich C. remembered to bring his Vermont Smoked Beef Jerky, and Sadira brought her smile. 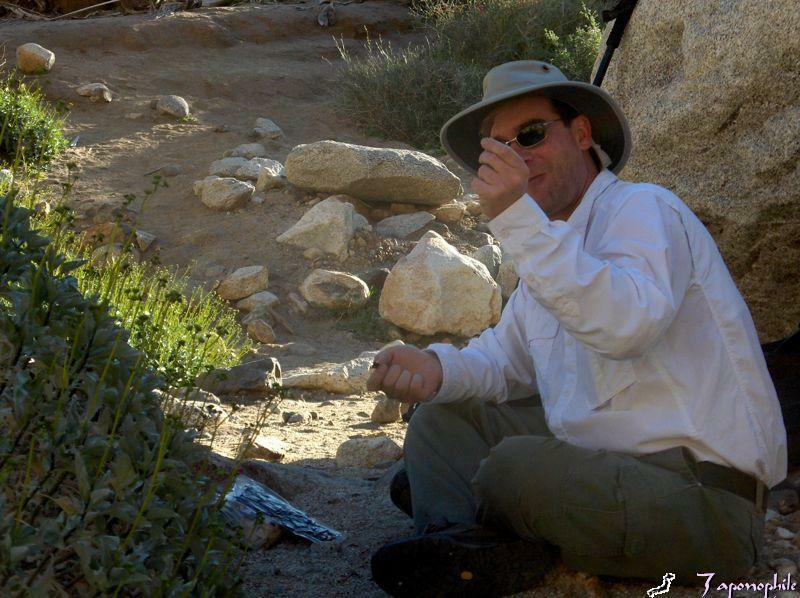 On a hunt for big game amidst the blooming spring wild flowers, we returned with our Safari to Anza-Borrego Desert State Park armed with our HP camera (pixels cranked up to the max) and the MacBook Pro raring to go. 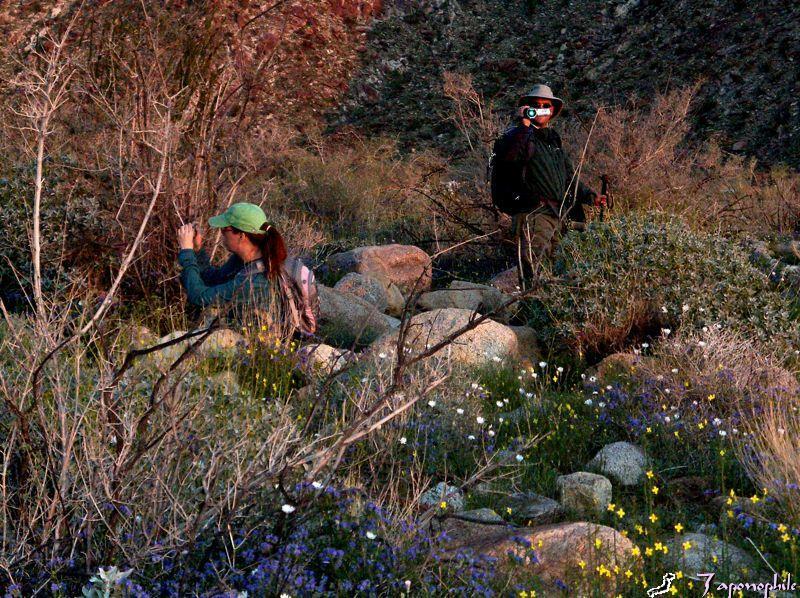 We joined Rich C. and Sadira for three, starry nights of desert camping in search of Bighorn sheep and wild flowers. 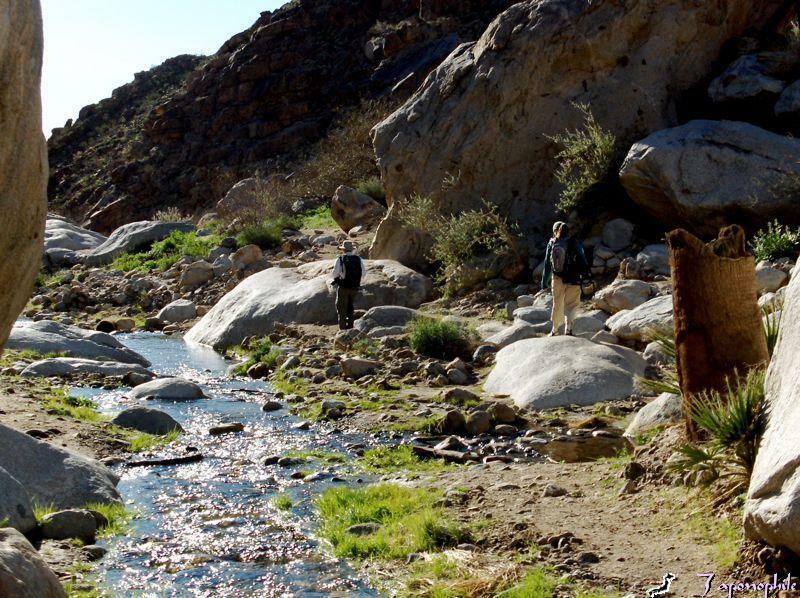 This trip also marked the first year anniversary of Rich’s return to Palm Canyon and his turn-around of fortune. 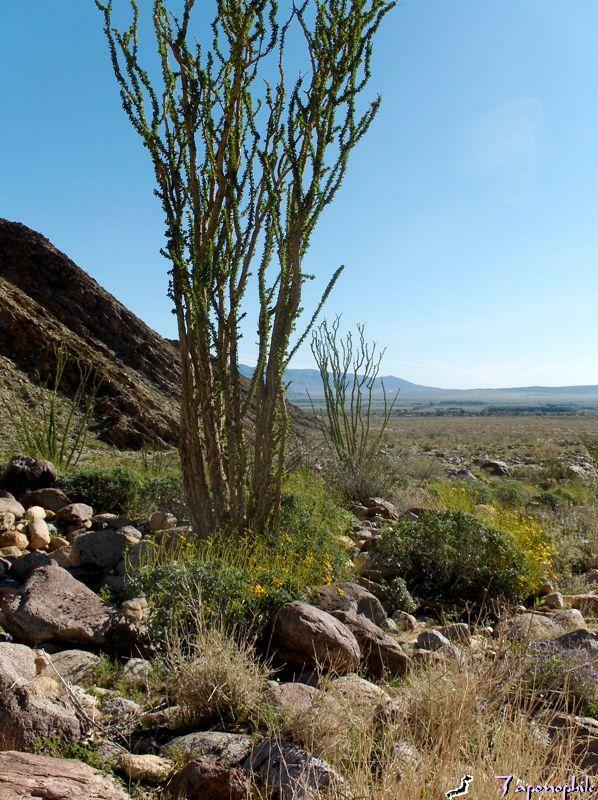 We all were excited about this trip because recent rains followed by the return of warm, sunny weather held out the promise of an early, glorious wild flower display. 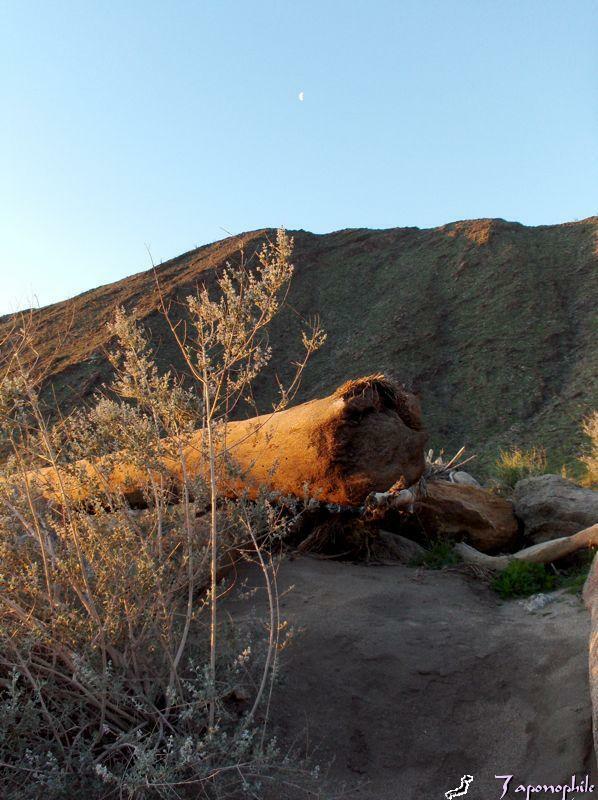 We got up before sunrise to hike up Palm Canyon and were not disappointed. 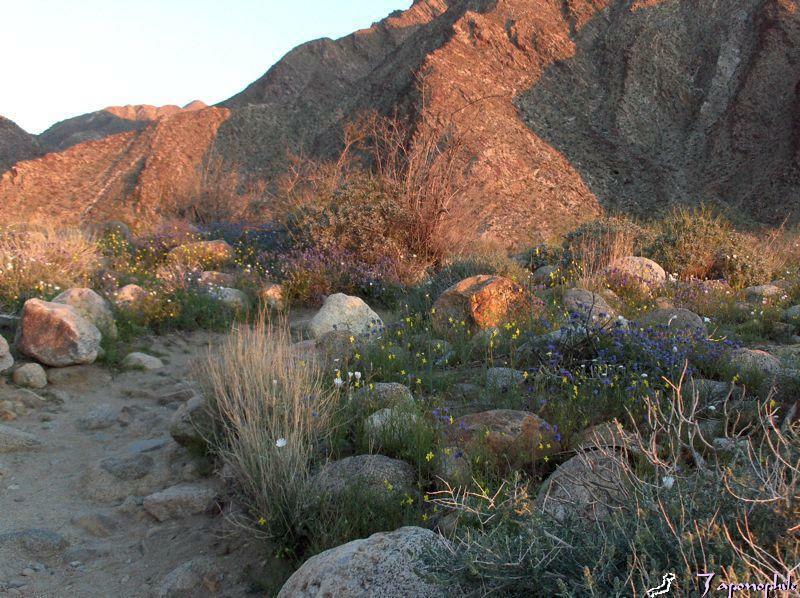 A blanket of wild flowers greeted us just a few feet into the trail head. A photo op was present everywhere we turned. It was also a study of contrasts, lush new growth next to dead palm tree trunks from previous floods. 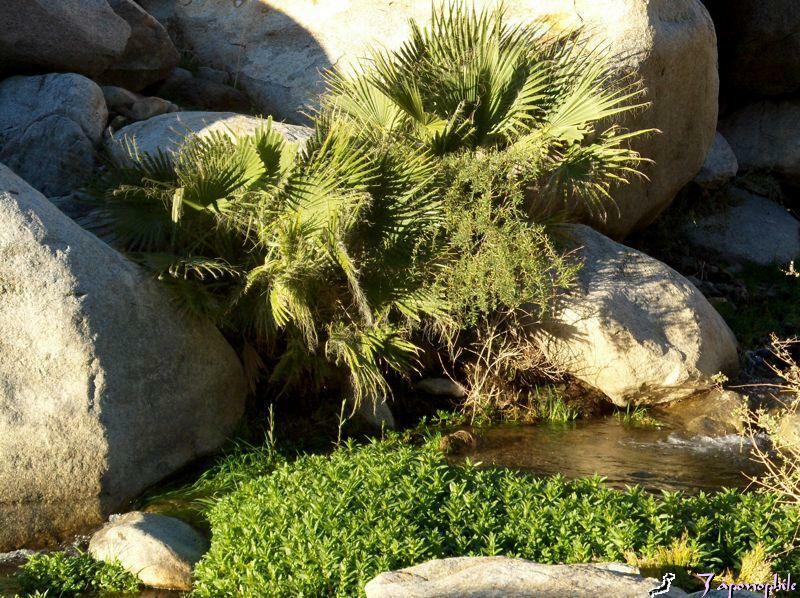 Along the way, we enjoyed the refreshing and soothing sounds of the briskly flowing Palm Canyon creek. Rich C. enjoyed his Vermont Hickory Smoked Beef Jerky. 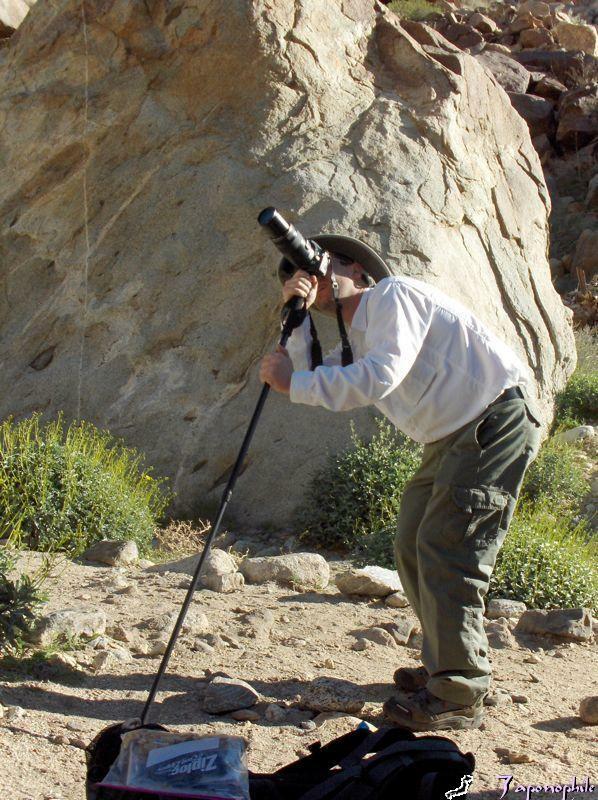 Thinking that he had spotted a Bighorn sheep up along the ridge, Rich hopped up and quickly attached his Canon EOS-30D camera (with 70-300 mm Canon lens) to his Tricks Stick monopod . But it was only a rock. 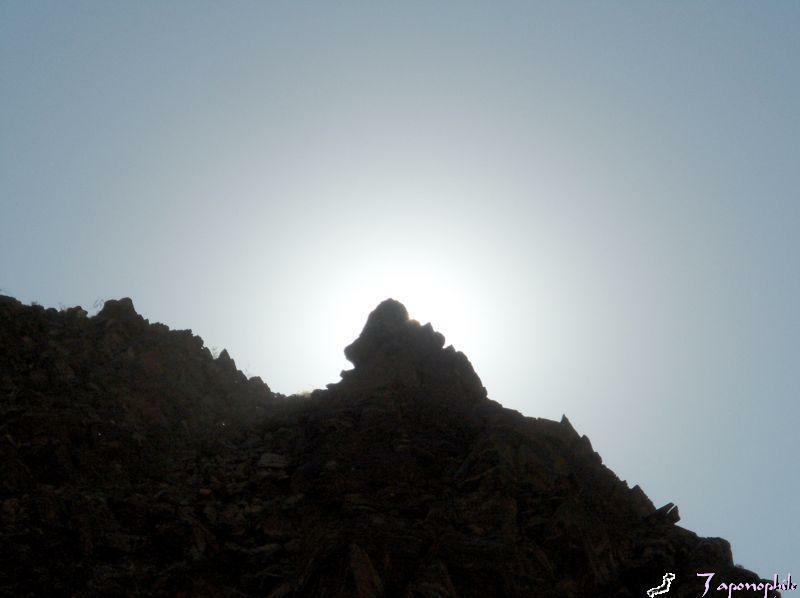 I thought that I had seen a lion up there, but it was actually a ridge silhouette in front of a glowing sun. The big game animals were elusive this time, but the splendor of spring wild flowers cheered us as we made our way back down the trail. 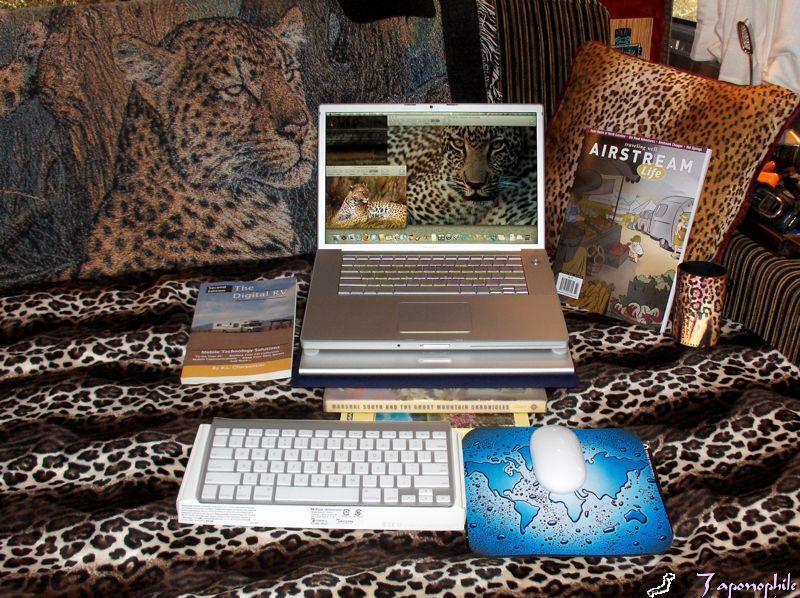 But at least I can report that I spotted more than one leopard right in our own Safari. The trophy was actually the latest operating system of our new MacBook Pro.